Crislyn D’Souza-Schorey received her doctorate from the University of Texas Health Science Center at San Antonio, following which she was a postdoctoral research fellow and research assistant professor at Washington University School of Medicine in St. Louis. She joined the University of Notre Dame faculty as the Walther Cancer Institute Junior Chair in 1998. A major line of research investigation in her laboratory is to understand the molecular and cellular basis of initiation and progression of epithelial cancers. A second line of research involves understanding the molecular basis of rare neurodegenerative disorders such as Huntington’s Disease. 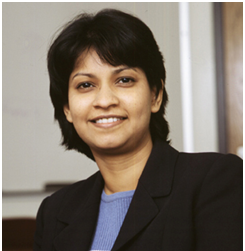 D’Souza-Schorey has received several awards and honors during her career, including the Robert Welch Pre-Doctoral Fellowship, the Lucille P. Markey Post-Doctoral Fellowship in Pathobiology, the Leukemia Society of America Special Fellowship, Young Investigator Awards from the Leukemia Research Foundation, and the Michael K. Guest Award for Innovative Cancer Research. Research in her laboratory has been supported by federal and non-federal sources including the American Cancer Society, American Heart Association, U.S. Department of Defense, the National Institutes of Health, and the Walther Cancer Foundation (formerly, the Walther Cancer Institute). D’Souza-Schorey serves on scientific review panels of the National Institutes of Health and the U.S. Department of Defense-Breast Cancer Research Program. She also serves as a scientific reviewer for international funding agencies such as the Welcome Trust, the Dutch Cancer Society, and the Health Research Board of Ireland. At Notre Dame, she is actively involved in undergraduate and graduate education, both in the classroom and the laboratory.